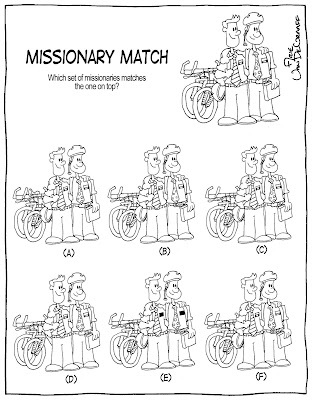 Ward Cartoonist: Just What's Inside The Puzzle Book for LDS Kids? Just What's Inside The Puzzle Book for LDS Kids? So The Puzzle Book for LDS Kids has been in bookstores for two weeks now and it's still not showing up on the New York Times bestseller list. Clearly, something is wrong here. Look, I know that times are tough and maybe you've been burned on so-called "activity books" in the past (you know the type with nothing more than a couple of word searches, a few dot to dots, and that awful page where you're asked to make as many words from another word as you can (as an aweful spailler I reelly haite those things (thank heavens for word processors (this may be the most parentheses inside parentheses ever)))), but my book is different! What did your kids think of the book? Did you test the puzzles out on them before you let them in the book? Yes, the book did pass a rigorous testing stage and received an endorsement from a seven and five-year-old. Also successfully tested on a 43-year-old and a 6-year-old. i used to love these as a kid. so fun!